Warning: This article contains spoilers for season nine of The Walking Dead. It’s still one of the biggest TV shows on the planet. AMC’s massively successful post-apocalyptic drama The Walking Dead has been scaring audiences across the globe for nearly a decade. But with falling viewing figures, some fans being critical of recent storylines and a couple of its biggest names due to depart, the new ninth season could be its most crucial yet. Quite a challenge then for new showrunner Angela Kang, who’s spoken in depth to Radio 1 Newsbeat, in her first UK radio interview. As we chatted, Angela appeared to hint at extra detail about the future of its lead character, Rick Grimes, played by British actor Andrew Lincoln. Once again: spoilers. You have been warned. Angela Kang is a veteran writer in The Walking Dead’s gore, blood and walker-filled world. But now she’s taken over from Scott M Gimple as the boss and begins with moving the show on to a new chapter, away from its lengthy “All Out War” storyline that saw the characters take on baddy Negan. The plot was divisive. Certainly the longest running story in Walking Dead history and some fans have been critical about the show feeling slow over the last couple of years. But those viewers will no doubt be encouraged by the direction the new boss is taking this season. The early reviews for season nine have been very positive. “I’ve been on the staff since season two and we’ve played with the pace in which we do things. We’re always trying to take creative risks,” Angela tells Newsbeat. “We were looking for ways to mix up our storytelling and one of the things is trying to amp up the pace, so there’s always a big momentous plot twist in each episode. It’s not just the storylines changing. In a move that some fans never thought would happen, AMC has confirmed that Andrew Lincoln’s Rick Grimes has already filmed his final scenes. His decision to leave didn’t come as a shock to Angela and her team. They knew Andrew wouldn’t want to live on the other side of the world to his family forever. “This is a show with dead in the title. There are going to be losses,” she says. The departure of one of TV’s most iconic characters will air this season, but for now how he leaves is a closely guarded secret. “What I can tell you is, that it’s a very emotional story. We get to look back at some of the scenes that he’s been dealing with ever since his story started on the show. Angela also confirmed to Newsbeat that another British actor, Lauren Cohen, and her character Maggie will leave in the upcoming episodes, while Lauren works on other projects. A return next season seems a formality though. So does that mean The Walking Dead’s original leading man could one day make a triumphant return and therefore not leave in a pool of blood? “He is definitely out of the show this season. The intention is, this is his exit from the show. The show’s ratings are down. But with the rise of streaming TV services and people banking shows to binge-watch, you could argue that’s to be expected. In the US its single-episode viewing figures peaked in season five with a massive 17.29 million. 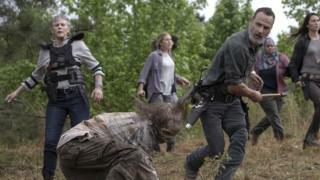 But even after its dip, last season The Walking Dead regularly hit the eight million mark. To put that in context, titans of TV like Breaking Bad peaked at 10.28 million, while Game of Thrones’ 8.89 million for its latest episode is the highest it’s got so far. In the UK on Fox, The Walking Dead’s numbers are impressive too. 482,000 people watched the season nine opener. Angela insists she isn’t worried about ratings. She says as long as the source comic continues to throw out “great source material”, the show will continue. “Robert Kirkman’s comic book continues to grow strong,” Angela says. “As I’ve been working here I think I’ve definitely had the experience where I say: ‘This is the best storyline that has ever been written for the comics. It can’t be topped, we’re going to have to end the show’. “But then he comes up with an amazing twist that makes us keep on reading. There are a lot of ways in which the story could end. For the first time in its long history, The Walking Dead now has a woman in charge. It’s a fact Angela seems proud of. “I had so much opportunity growing up in the US that my parents didn’t have back in their home country of South Korea during a military coup and dictatorship back in the seventies,” she says. “But growing up there weren’t really figures that I could look to and think, ‘That’s a job I could do’. You didn’t really see women or people of colour, certainly not women of colour, who had this kind of job in the industry. “It’s still not very common now. It’s very moving to me, when I hear from people saying, ‘I want to do what you do when I grow up’, because I think having those figures to look to is important. “Representation does do something for children. It expands the scope of their dreams so that is something that I appreciate. The Walking Dead continues on Mondays at 9pm on FOX. Has Star Wars reached peak prequel?